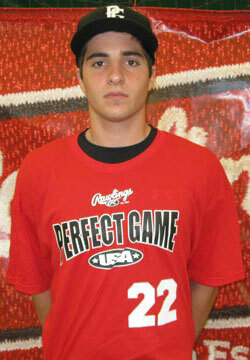 Justin Sisbarro is a 2010 1B/OF with a 6'2'', 195 lb. frame from Lititz, PA who attends Manheim Township. Lean, athletic build. Soft hands at 1B, moves well around the bag, short arm action with quick release. Active in the field, works hard. Has an easy swing with good mechanics at the plate. Makes consistent, hard contact, good leverage creates easy power. He is an outstanding student.